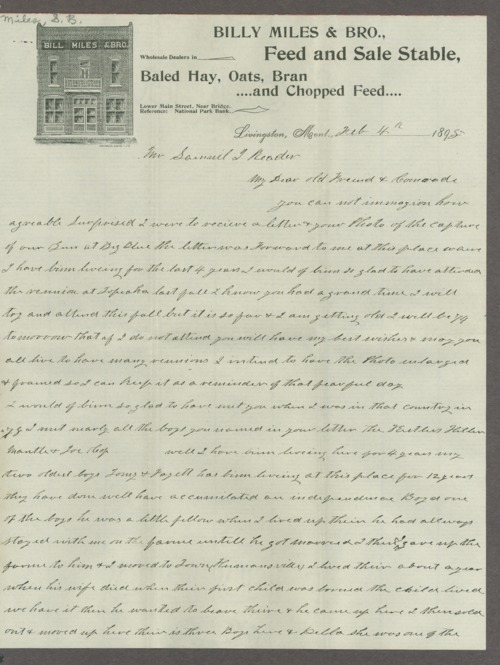 These letters from numerous individuals were received by Samuel James Reader. Only two of the letters, dated September 24, 1898, and October 11, 1899, were written by Reader. Many of the letters refer to the Battle of the Blue, which was Reader's only war experience. The battle occurred on October 22, 1864, in Jackson County, Missouri. The authors of some letters wish to thank Reader for sending them photographs relating to the battle, and others are former comrades from the 2nd Kansas Regiment responding to Reader's letters. Reader received letters from Salmon Brown, the surviving son of John Brown, and Jesse R. Grant, son of Ulysses S. Grant. Six of the letters, dated 1908 and 1909, come from Reader's "boyhood acquaintance" Joseph Smith III, who lived in Independence, Missouri. In one letter, Smith reminisces on time spent in La Harpe, Illinois, where Reader once lived. Smith also acknowledges that he was an abolitionist, who "sympathized with Kansas and her Free State men who prevented the accomplishment of the wicked intent of the Missouri Compromise."